Roll up! Roll up! Roadburn Festival is proud to present At The Gates… as you’ve never seen them before! We are all familiar with At The Gates – whether you were there from those early Peaceville days, if you were lured by Slaughter of the Soul, or even if you only discovered them via their latest release, this year’s To Drink From The Night Itself – we all know what a colossal beast of a band we’re dealing with here. Despite 19 years between albums, and the band being officially broken up for over a decade of that, the impact of At The Gates hasn’t dulled since they first crashed into our record collections way back in the early ‘90s. Those among us fortunate to have witness the live incarnation of At The Gates in recent years know that they’re as vital as ever, a fact cemented by To Drink From The Night Itself which will surely be topping year end lists come December. Although we are huge fans of At The Gates, it wasn’t a given that they’d be on the line up when we signed up frontman Tomas Lindberg as our 2019 curator. Having headlined festivals around the globe and established themselves as a force to be reckoned with at club shows, would they think us a good fit? It soon became apparent that not only were they keen to play, they were dead set on doing something different; presenting the band in a whole new way. Details are still being finalised regarding exactly what the set list will comprise of, and just how those songs will be presented, but what we can tell you is that it’s going to be a must-see part of Roadburn 2019. “When we first formed At The Gates back in 1990, we did so with a clear intent. We never, ever wanted to paint ourselves into a corner. We were very inspired by a lot of different music even then, citing bands as diverse as Swans and King Crimson in our first biography. We were of course very pretentious youngsters at the time, but that urgent ambition has stayed with us to this day, and the latest album To Drink from the Night Itself, in our view, is yet another statement in that direction. “As many of our loyal listeners know we have always incorporated different elements into our own breed of death metal, but we have never taken the chance to explore them to the fullest on stage. Being invited to play the prestigious Roadburn Festival gives us exactly that opportunity. We know very well what is expected from a Roadburn performance, and it is just that sort of challenge that makes us tick. “We will dive headfirst into the melancholic eclectic darkness of our back catalogue and explore different, challenging collaborations for this special At The Gates set. We look forward to this with overwhelming excitement. More details on exactly what will happen on that main stage at 013 will follow soon” – At The Gates / September 2018. 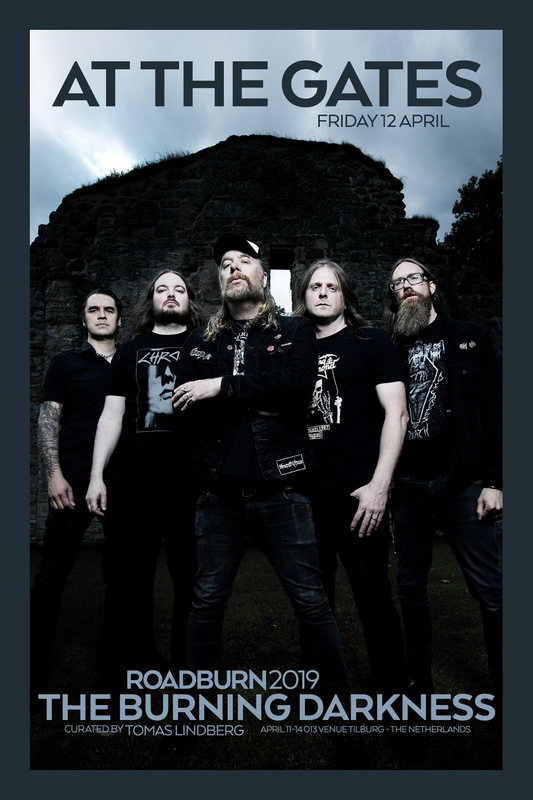 With six studio albums under their collective belts, and with the best part of three decades of experience, we are thrilled that At The Gates are so determined to raise the bar another few notches when they perform at Roadburn 2019. Join us in welcoming a whole new incarnation of At The Gates. 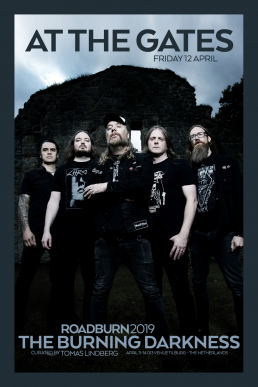 At The Gates will be performing at TivoliVredenburg, Utrecht (NL) on Saturday, February 2.